See the page under cleaning section for removing carpet glue. Holes from carpet tack strips can be patched with the appropriate color grout. A "non-sanded" grout provides a smoother finish. The grout can be sanded down to the polish level of the rest of the floor. Restore patch finish with a fine grit "wet / dry" sand paper (approx. 1500 grit) and water. Then finish with #0000 steel wool. At each stage use a circular motion and vary pressure to blend out the edges. 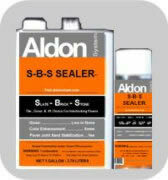 "S-B-S Sealer" and "Lifeguard" are the last steps to provide the glossy protective finish. Sometimes cleaning and restoration is a trial and error process. The cause of the problem might be different than thought, or have multiple causes and results that must be handled in steps. In rare cases, it cannot be cleaned. Proceed as though it is an experiment whose results must be evaluated.